World-class skiing and snowboarding aren't the only reasons to come play for a day (or a few) at Timberline. From snowshoeing to guided mountaineering, discover all the other fun and thrilling activities we have to offer. For the ultimate Mt Hood experience, take a snowcat ride to the 8500 foot elevation with our Take Me to the Top Package. Toast the exhilarating mountain air with a glass of Timberline wine and marvel at the unparalleled views of the Cascade Range. Weather permitting, we’ll take you to the top of the world-famous Palmer Snowfield, 8,500 foot elevation of Mt. Hood. The Take Me to the Top Package includes your choice of hotel room, a one hour snowcat ride for up to 8 people, a bottle of red or white wine, and a fruit and cheese platter (which can be enjoyed at the top of Palmer Snowfield or back at the lodge). Please indicate your wine preference in the “special request” section of the reservation. Departure time will be scheduled at 4pm on your day of arrival. Trips are subject to driver availability and weather conditions. The snowcat ride listed here is a special service for the Take Me to the Top Package only. 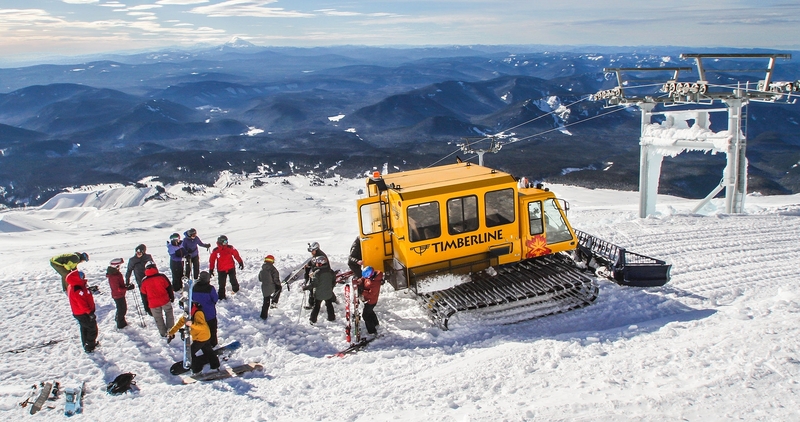 Timberline is no longer able to offer Climber Snowcat Transportation service. 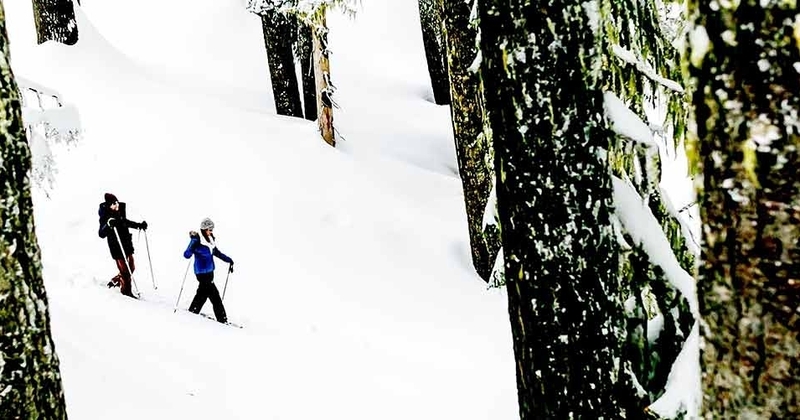 Snowshoeing is fun, easy, and there is no better place than Timberline to try it out. Walking atop the snow, you can move quickly for a bit of a work out or simply go for a leisurely stroll while you explore the unique high-alpine terrain surrounding Timberline Lodge. Our snowshoe trail is approximately 3/4 of a mile long and groomed daily. Snowshoe rentals are available in the Wy’East Day Lodge for $20 per person/per day (limited availability – first come, first serve). 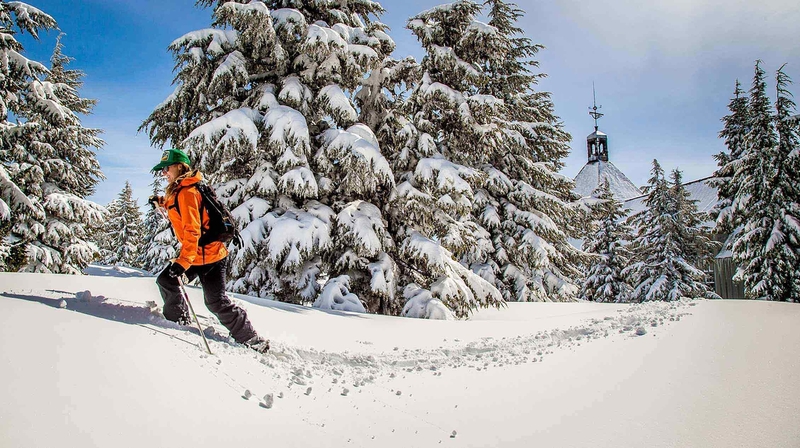 Here’s a few tips to make your snowshoeing adventure an enjoyable one. Dress warm: wearing multiple layers is beneficial so you can take one off after you work up a sweat. Remember a hat, gloves, and goggles. Bring a small backpack with water and snacks. If you’re missing any gear, stop in to our store in the Wy’East Day Lodge. We stock everything you need to get out on the mountain. Rentals: Available for $20 per person, per day first come first serve. During our winter season, you can catch a ride to 8,540 feet on Mt. Hood. When in operation, the Palmer Snowcat opens up 3,690 vertical feet of snowcat skiing and riding from the top of Palmer to the bottom of the Jeff Flood Express. Enjoy the groomed trails or adventure into untracked snow on the Palmer Snowfield – the choice is yours. Why not run the Palmer Express lift to the top in the winter? Well, it was installed in 1996 to service our summer ski operations. While we wish it was possible to maintain it in the winter, frequent and heavy storms coat the lift towers in thick snow and ice. These storms often have wind speeds exceeding 100 mph and brutally cold temperatures. These factors make de-icing the lift virtually impossible. It’s typical that in the spring we have to replace many of the components on the lift that have broken or that have otherwise been compromised by the elements. So, in place of the lift, we offer our Snowcat service for your snowcat skiing enjoyment. The Palmer Snowcat service typically runs on weekends and holidays from 10am to 2pm when weather permits, and is FREE for lift ticket and season pass holders. Check the Conditions page for Palmer Snowcat operating hours. To get there, take the Magic Mile up and unload to the right. Proceed toward Silcox Hut and you’ll see the line for the snowcat. We always have a Ski Host in a yellow jacket managing the line – so feel free to ask them any questions. A ski patroller will accompany you to the top and will advise you on any specific conditions you will need to be aware of as you begin your snowcat skiing or riding adventure. Conditions can change rapidly on Palmer and are often variable. The Palmer Snowfield is recommended for advanced skiers and riders only. Tubing and sledding are NOT permitted at Timberline Lodge but guests can tube at Timberline's sister ski hill, Summit Ski Area, located in nearby Government Camp. Summit Ski Area was established in 1927, and is the second oldest continuously operating ski area in the United States. Summit’s base elevation is 4,000 ft. and has 306 ft. of vertical lift for skiing and snowboarding. Summit Ski Area caters to families and novices. Summit Ski Area will be closing for the season after April 14th. The last days of winter operations are Saturday and Sunday, 9am to 4pm.